Whenever we are visiting my husband’s extended family and my brother-in-law is around, he’s often the one in charge of breakfast because he’s an early riser. 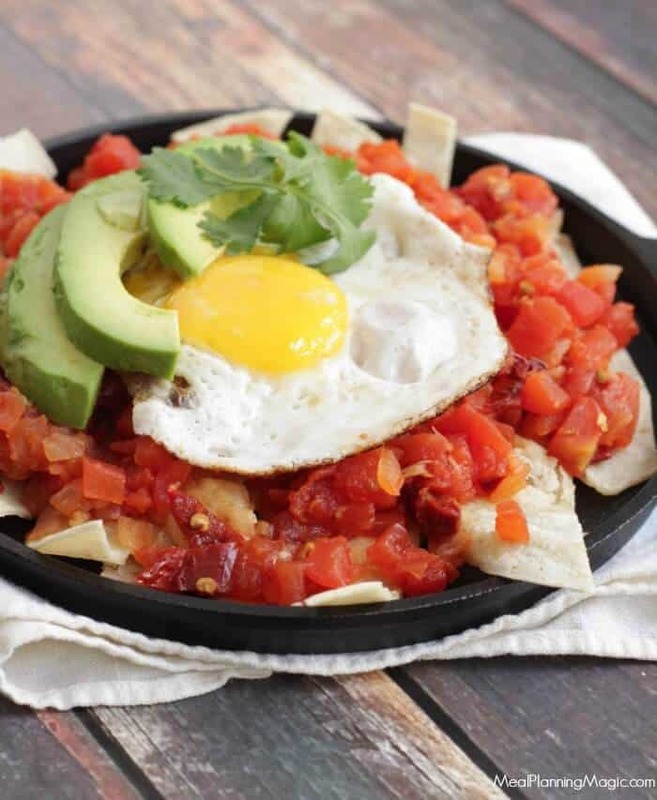 I’m always excited when these Chilaquiles are on the menu because they are really one of my favorites! And I’m not really sure why it took me so long to start making these myself because they really are SO easy to make. The combination of flavors is so delicious with just a little bit of kick! 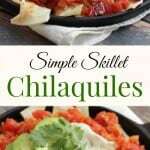 In small bowl, combine tomatoes and peppers. Set aside. In large skillet, sauté olive oil, onion and garlic until onion is tender. Add tomato mixture to skillet. Simmer until thickened, about 10 minutes. Meanwhile, preheat oven to 350°. On large baking pan, bake tortillas for about 2-3 minutes until slightly crispy. (I have also been known to bake them directly on the oven racks!) Remove from baking pan and cool just enough so that you can slice them into ½-inch strips. In a separate pan, fry eggs to desired doneness (I like them just until overeasy when the yolk is still a little runny). 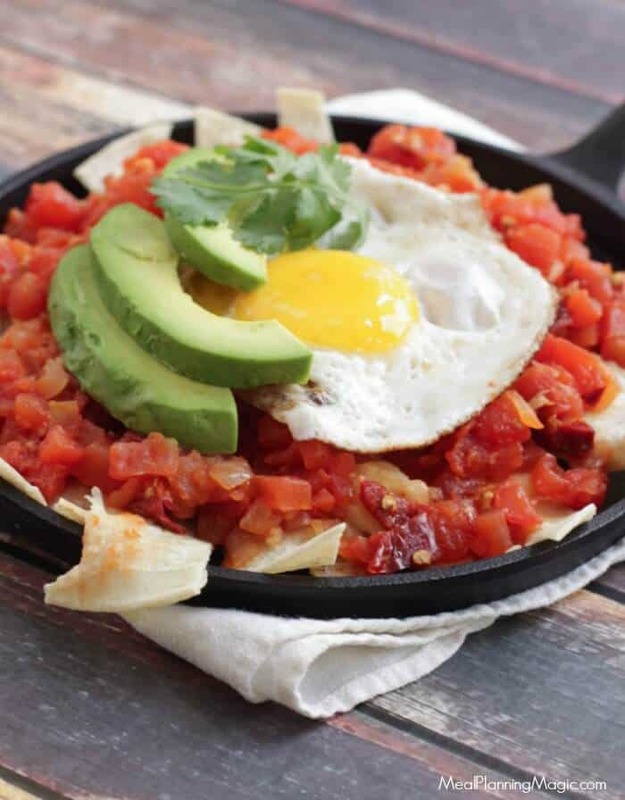 To plate and serve, layer in this order: ¼ baked tortilla strips, ¼ tomato mixture, egg, ¼ avocado slices and cilantro leaves. Serve and enjoy! 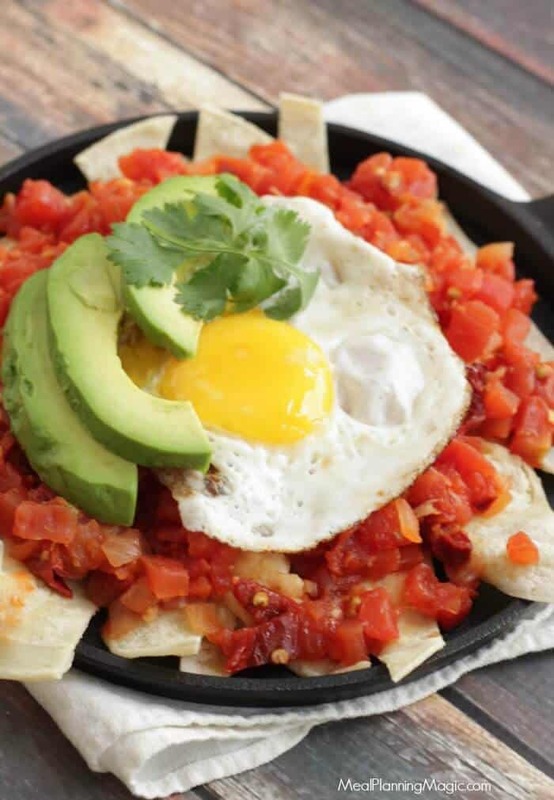 What’s even better about these Simple Skillet Chilaquiles is that my whole family loves this dish so I’ve finally got a breakfast that everyone enjoys. You can even make the tomato mixture and bake the tortillas ahead of time and just do the assembling part on the day you plan to serve them. That means these can pretty easily be added to a busy weekday morning, since all you’re doing is cooking the egg and assembling everything. I hope you’ll give them a try soon too! And don’t forget you can always follow me on Facebook, Twitter, Pinterest , Instagram or Google+. And don’t forget to sign up for my email list here so you never miss a new post! Each of these ways to connect all offer a little something different and are a great way to stay in the loop on new menu plans, recipe ideas, giveaways, organizing tips and more!